Ditch the Wheat. Three words and a cookbook that will forever change your life. Carol Lovett delivers a culinary masterpiece that will leave you satisfied and feeling terrific, while enabling you to happily break free of grains, gluten, legumes and dairy. 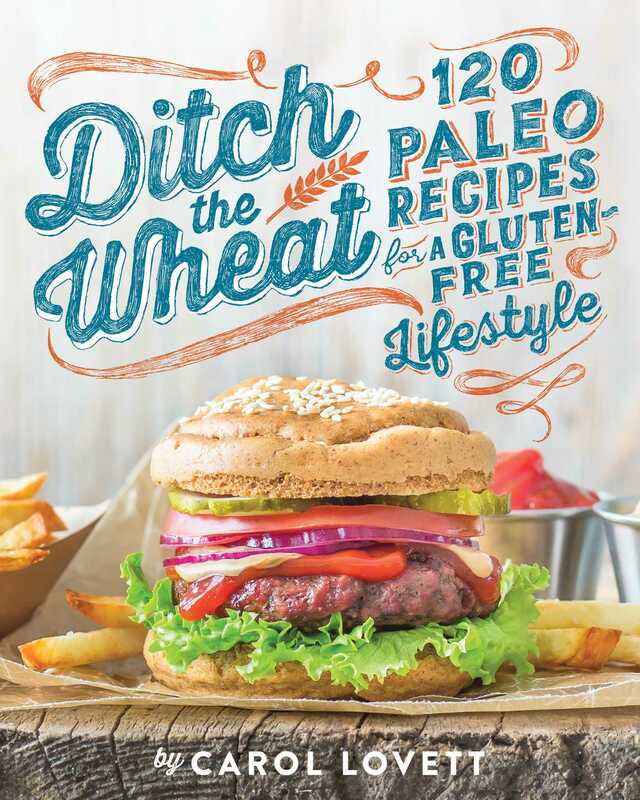 Ditch the Wheat offers over 120 paleo-friendly recipes that are perfect for anyone looking to change their diet or just diversify their existing recipe box. Having battled with her own health problems, Lovett found relief through eating a grain-free diet and steering clear of many other foods with inflammatory properties, such as dairy, legumes and highly-processed foods - the catch, she didn't want to sacrifice any of her favorite dishes. Lovett creatively adapted everyday meals such as pizza, pasta, doughnuts and cake, yes cake, to her grain-free life and now is sharing her best kept secrets with you! Ditch the Wheat allows the user to feel empowered with an abundance of food choices. In this cookbook you will find recipes that incorporate healing foods such as bone broth and others that are meant to bring simple joy to your life like grain-free chocolate chip cookies. Ditch the Wheat goes beyond the average cookbook. It is packed with useful step-by-step tutorials that will aid you in navigating your grain-free kitchen and teach you how to make food from scratch using the finest quality and nourishing ingredients. Lovett teaches you how to make grain-free pasta and homemade salad dressings and much much more! All recipes use simple ingredients and techniques that will take the intimidation out of preparing allergy-free recipes from scratch and won’t break the bank. Too few cookbooks today inspire, impress, and satisfy all at once. Ditch the Wheat is a rare exception. Carol’s sensible approach to allergen-friendly living is doable for everyone, and it doesn’t hurt that this book is packed to the gills with delicious recipes. This is a must-buy! I've always loved Carol’s recipes, but her new book, Ditch the Wheat, is so much more than just another cookbook. She has created sophisticated, beautiful recipes that are simple enough for a family weeknight dinner but special enough for entertaining guests. Her attention to detail makes this a comprehensive book that will help guide beginners as well as inspire seasoned cooks. I can honestly say I’m looking forward to cooking regularly from this book; it will collect no dust on my shelves! In this debut book by Carol Lovett, you’ll have a feast for your eyes while you heal your insides. From grain-free crackers, cupcakes, and caramel sauce to bone broth and fermented foods, this cookbook has something for everyone to live their healthiest life! Ditch the Wheat does what other Paleo cookbooks do not. It emphasizes pasture-raised animal foods, nutrient-dense ferments, and nose-to-tail eating. From Sweet Potato Nacho Dip (a dairy-free taco-flavored dip that’s sure to please) to Creamy Tomato Mushroom Chicken Pasta (made with veggie noodles), the flavor combinations in these recipes are delightful. I think it goes without saying that food is incredibly important in our daily lives. In Ditch the Wheat, Carol has truly embraced and portrayed the beauty of real food. A lovely medley of beautiful photographs and easy-to-cook recipes entices you to get in the kitchen and cook with gusto.